The secret to perfect scrambled eggs is butter. 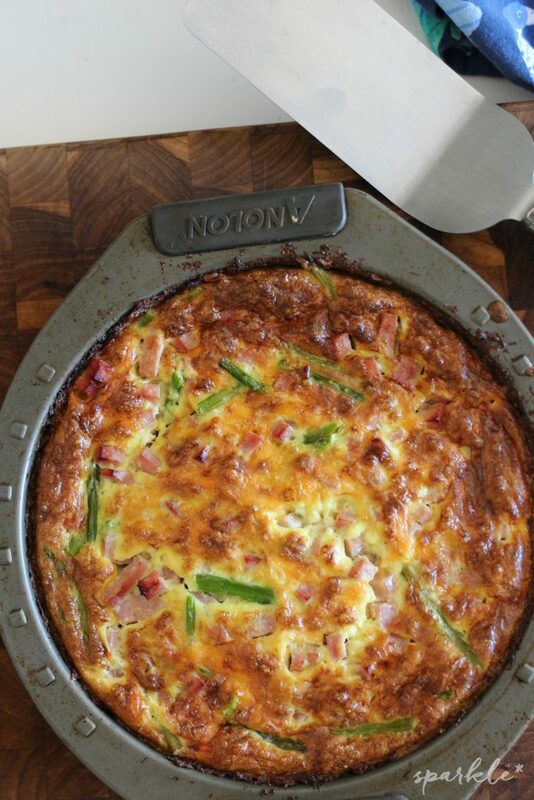 Cook them low and slow and they will turn out creamy and tasty everytime! I know, I know. Scrambled eggs aren’t hard to make. At least they shouldn’t be. 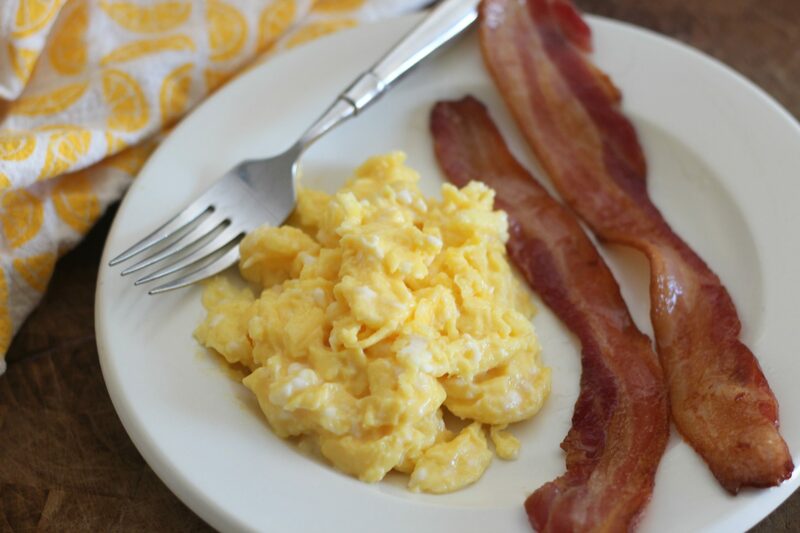 But I have had some terrible scrambled eggs in my day and considering they are pretty much a staple in a low carb lifestyle, I felt it necessary that I get this perfect scrambled eggs recipe out there. I have always heard people argue over whether you need to add water or milk to the scrambled eggs. Um no. You add neither. 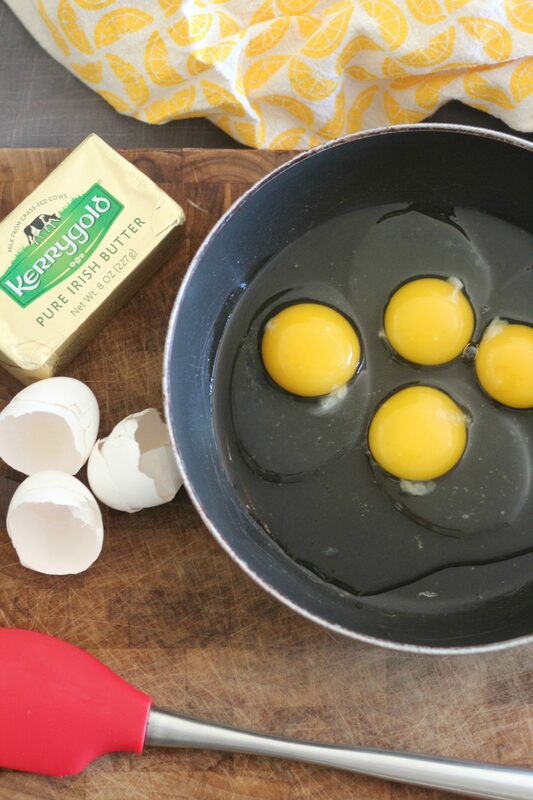 The ingredient to making perfect scrambled eggs is butter. Delicious, creamy, butter from grass fed cows. It makes all the difference in the world. I eat eggs nearly everyday, usually around mid-morning. The fat and protein keeps me full for hours and I find that over the course of the day I snack less if I have eggs in the morning. Remember, on a low carb and keto diet FAT IS YOUR FRIEND! I have a specific non-stick pan that I use only for eggs. I find that I can taste flavors of other things that have been cooked in this pan and I don’t like it. So it’s eggs only for this pan. Sometimes the Mr will get back at me for something and will cook meat or something garlicky in this pan and it drives me bonkers! 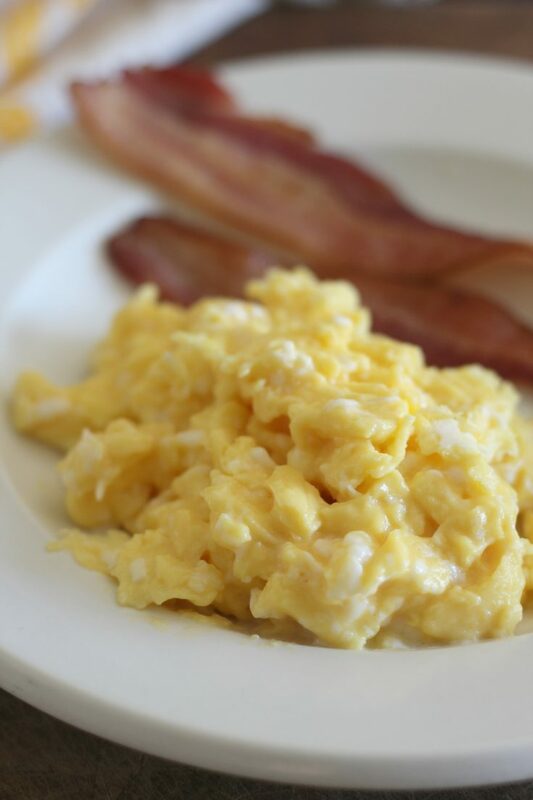 To make the scrambled eggs delicious and creamy start with room temperature eggs. Just break them in to the pan, no need to scramble them ahead of time. Add a tablespoon of butter. If your butter is unsalted or you prefer more salt, add a dash of Kosher salt. Place the pan on the stovetop and turn it to medium. Using a silicone scraper spatula, continuously scrape the bottom and sides of the pan as the eggs cook. 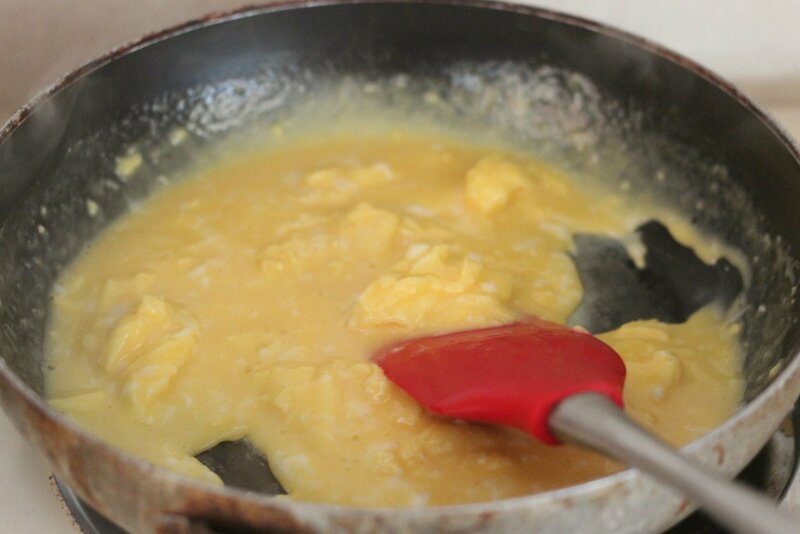 Right before the scrambled eggs are cooked to your preference, remove the pan from the heat. Add room temperature eggs to non-stick pan with butter. Add in a pinch of Kosher salt if desired. Cook on stove over medium heat, scraping edges and bottom of pan constantly. Remove pan from heat source just before scrambled eggs are at desired doneness. That’s it. I love my perfect scrambled eggs slightly loose, others like it chewy and well cooked. How do you take yours? I love scrambled eggs – with butter and cheese! Thanks for sharing at the What’s for Dinner party! 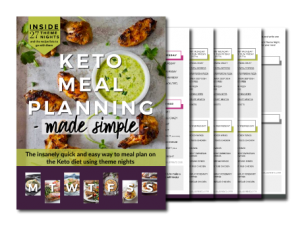 Hope you were able to check out some of the other awesome recipes there too! Thanks for sharing at FF #194!! This looks like a great plate of Scrambled Eggs, I pinned this one! Thanks so much for sharing with us at Full Plate Thursday. Have a great week and come back to see us real soon! Scrambled eggs can be so terrible and so utterly delicious! Yours look creamy and perfect! Thank you for bringing them to Fiesta Friday! Thanks for sharing at the What’s for Dinner party – have a fabulous week! We love scrambled eggs and I have to admit that they are never the same at our house. I am going to try your perfect scrambled eggs recipe. Thank you for sharing at Over the Moon. I love scrambled eggs and always cook them in organic unsalted butter. Like you said, they can keep you going for hours!. Love scrambled eggs. Thank you for joining the To Grandma’s House We Go DIY, Crafts, Recipes and More Link Party! Pinned this! Hope to see you again next week! Your scrambled eggs really do look perfect and I would love to have them right now. Thanks so much for sharing with us at Full Plate Thursday, we sure enjoyed your post! I am a butter lover, so I am all over this! 🙂 I usually add just a tad of milk, but going to try this next time. Thanks for sharing with SYC.